Songs of praise filled Gobind Sadan’s auditorium as everyone’s eyes filled with tears. On the stage where leaders from all over the world had convened conferences to highlight Babaji’s mission for peace, Baba Virsa Singh ji’s body lay in state. All day and night, devotees gathered to pay their farewells and take a final glimpse of the one who had changed their lives. An honor guard stood with swords drawn before the clear casket, as people filed by to shower petals, lay wreaths and garlands, and wave Chauri Sahibs over their beloved spiritual Master. The Ford Bronco that had carried Babaji through the rough roads as he spread his message of love and developed countless acres of wastelands into productive farm lands was decked out with flowers to carry him on his final journey. As the time approached, Babaji’s body was escorted by a procession led by the honor guards dressed in saffron colored clothes, followed by women singing praises and carrying trays of oil lamps. Anyone who could get near enough through the throngs, rushed to touch the car, shower flowers, or just walk along the path leading down from the auditorium to the field below. All night long, devotees kept a silent prayer vigil while the fire burned down. Tomorrow the ashes and remains will be collected and interred on that spot. Next Sunday the 6th his memorial service will be held at 1 pm.. People from all over the world will flood Gobind Sadan to pay tribute and sing his praises. His Holiness Baba Virsa Singh, internationally renowned spiritual leader, founder and preceptor of Gobind Sadan, had left this world on Monday morning the 24th, after a brief illness, to continue His battle for Goodness on another plane. Throughout His life on this earth, Babaji was an outspoken defender advocate and champion of inter-communal harmony, he was a Healer and Spiritual teacher to countless individuals throughout the world. He was known for his prophetic statements about major world events such as the break up of the Soviet Union and the impact on the gulf war on American life, and countless miracles of sight to the blind, healing leprosy, allowing the cripples to walk have been documented since his childhood. But Babaji himself always felt the greatest miracle was changing the human mind towards good. 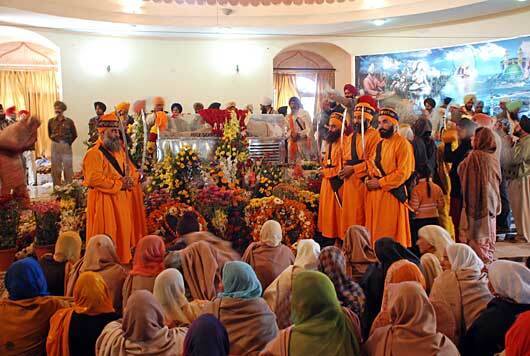 Known as “God’s House without Walls,” Gobind Sadan has devotees in all the major countries of the world. Most notably, Babaji’s impact on Russia has been remarkable. “The world needs spiritual directions, which we have found at Gobind Sadan. Here we find what is missing in Russia in our grey everyday life. No doubt, we must get rid of poverty. Poverty is not an isolated problem. If we solve the problems from a spiritual perspective and transform human consciousness, then we will receive the wisdom to solve all our . The teachings of Baba Virsa Singh are the real mechanism of transformation. Though there are no words to express our loss, we know his teachings and spiritual presence will continue to inspire and change our nation and the world. Born on 20 February 1934, in what is now Rajajung, Dist Lahore, Pakistan. In 1947, during partition, he was uprooted and moved with his family to Sarawan Bodla, Mukhtsar District, Punjab. From childhood, he was recognized with great visionary and healing powers of Biblical proportion. Obeying the command of God, Babaji moved from place to place, from Karnal in Haryana, North of Bareilly in UP, to Simla, Amritsar, Chandigarh and finally Delhi, reminding people of dharma, the Eternal Truths of all religions beyond any sectarian divisions. He was directed to some dry, thorny, rocky land at the south end of Delhi offered by a devotee, Sardarni Nirlep Kaur. And in June of 1968 he began to develop that land into what is now Gobind Sadan, “God’s House Without Walls”—a paradise of peaceful gardens, tree-lined paths, round-the-clock devotional centers, and a free community kitchen for people of all faiths and all social levels where miracles are everyday occurrences. He developed farms elsewhere as well, including the huge model farm known as Shiv Sadan, reclaimed from a dangerous flood-prone wasteland on the banks of the holy river Ganges. People of all faiths and many countries come to Babaji at Gobind Sadan for his blessings and guidance, for practical spiritual training, for devotional worship, and for seva (voluntary service). Those working on the farms do strenuous manual labor from dawn to dusk, raising lush productive crops with yields far exceeding those in surrounding areas. The sevadars do not tire; they say they feel invigorated and blessed by the work. As they work, Babaji encourages them to silently recite God’s Holy Name in loving remembrance (“Ik Onkar Sat Nam Siri Wahe Guru”—”There is One God whose name is Truth, Praise the Ever Greater ,ever more wondrous God”) and Jaap Sahib – Guru Gobind Singh’s empowering Hymns of Praise. The work supports Babaji¡’s mission to overcome poverty and religious conflict and bring peace to both individuals and the world. To heal those poor in spirit, prayers are offered round the clock. To uplift the deserving poor, langars (free community meals where people of all castes sit side by side on the ground), free medical care, schooling for children, are offered free of cost. And to teach reverence for all those who bring God’ message and their teachings, Babaji holds interfaith gatherings and celebrates the major holidays of all religions. Baba Virsa Singh makes no claim to being a guru; he does not seek fame, followers, or money. He says, “I am just trying to be a better human being. What I say is not new. I just repeat the commands of God so that people will remember them.” The lives and teachings of the Sikh Gurus are the model for his practical work, yet he continually refers to the timeless teachings revealed by all Prophets. He stresses that sectarian divisions have been created by humans, not by God or God’s Messengers. His basic program is the same for everyone: Recite Nam, read Jaap Sahib (Guru Gobind Singh’s empowering Hymn of God’s praises), do seva and rise early in the morning to begin thanking God and looking within yourself to battle with your own evils. To build interfaith understanding, Babaji teaches everyone to show reverence to each other’s traditions and the Messengers. Gobind Sadan is a practical demonstration, where the major holy days of all traditions are celebrated. On a daily basis, while continuous readings from Guru Granth Sahib go on, prayers are offered at the sacred fires (havans) 24 hours a day. People come to pray at Jesus’s place, the Sh’ma Place, the Mosque, and the Mandirs that dot the hillside. Babaji also defends the good name of all God’s messengers and speaks out against those who would malign another’s religion or prophet. Babaji goes so far as to say. He has practically demonstrated how to transform those we consider terrorists into productive citizens, in both the Indian states of Mizoram and Punjab. He feels that the current methods to stamp out terrorism have just increased its spread. He condemns violence in the name of religion, stating that religious fundamentalists are the real atheists who turn people away from God. “The scientist and the dervish are both lost in their search – one for the key to creation and the other in their love for the Creator. When they sit together, the scientist discovers that spiritual enlightenment is the greatest science and his research can actually progress more rapidly for the benefit of all humanity. Everyday Miracles—At Gobind Sadan, what some may consider miracles are everyday occurrences. Diseases are cured, business and personal problems, and even social conflicts solved almost immediately through prayer at the various Holy places.